Originally posted: September 30, 2017 . Last modified: February 11, 2019 . 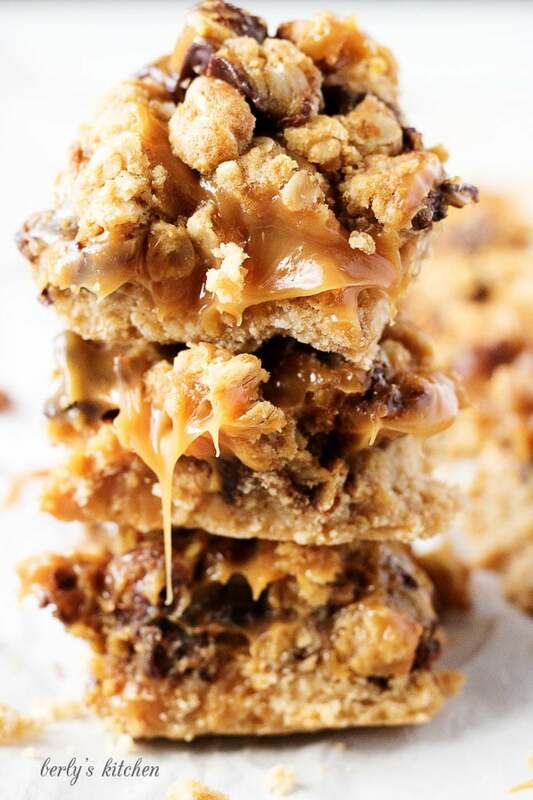 Ooey, gooey, and dripping with caramel, Chocolate Oat Carmelita Bars are the way to satisfy any sweet tooth. Who can resist a layer of melted caramel and chocolate sandwiched between a shortbread crust and oatmeal topping? 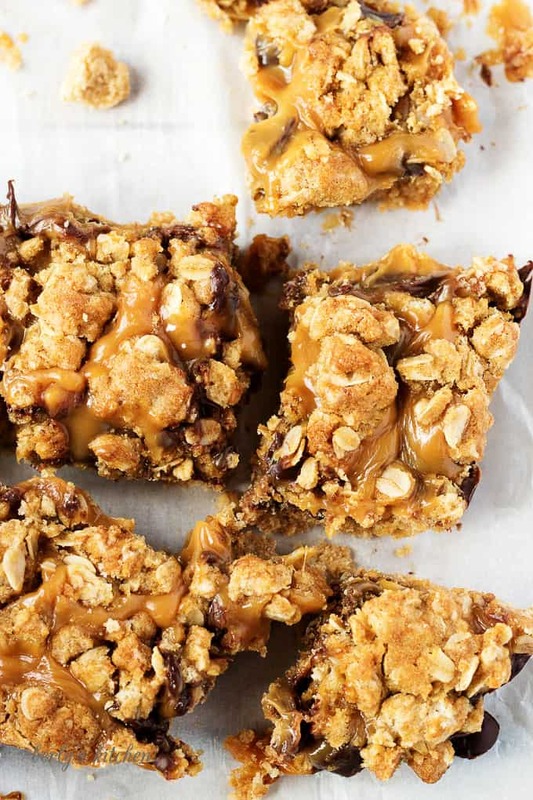 Chocolate Oat Carmelita Bars are one of our absolute favorite desserts (right up there with sugar cookies and coconut pie). 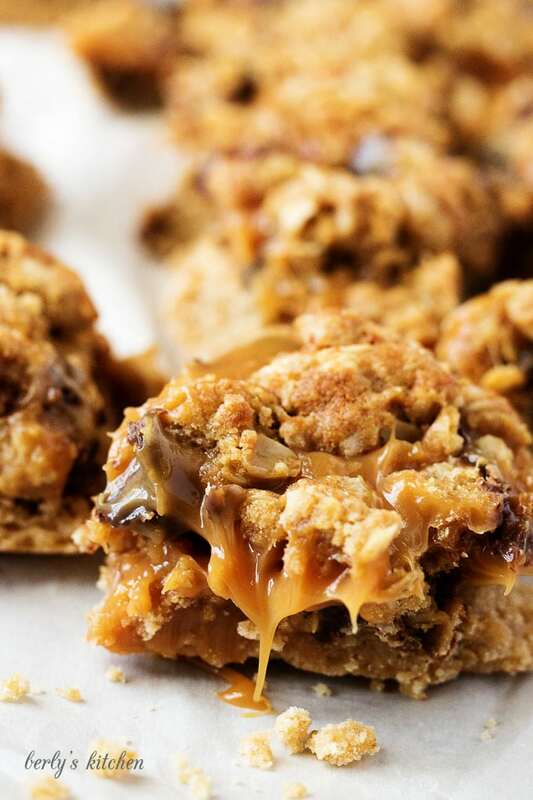 They are the perfect balance of buttery shortbread, creamy chocolate, rich caramel, and a crumbly oat topping. Carmelitas are one of those desserts that we don’t make very often, but when we do, they don’t last very long. They are a little on the messy side but so worth it. Just a quick tip, it’s best to read the recipe all the way through before getting started. There are several different parts and steps, and the bars have to set in the fridge for a while before serving. 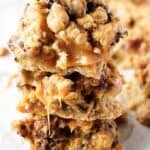 Chocolate Oat Carmelita Bars are best made over the weekend or on a day where you’ll have plenty of time to devote to baking. Since this recipe contains several steps, I’ve included them in the post and included some tips, as well as, a condensed version in the recipe card. Within a day or two of the post going live, there will also be a video showing the process. If you watch the video through until the end, you’ll see what happens when the Chocolate Oat Carmelita Bars are cut just a wee bit too soon. It’s really important to let them cool completely. More about that later. Preheat the oven to 325 degrees. Cover an 8 x 8-inch pan completely with parchment paper. The parchment paper should wrap around the sides to ensure the contents don’t spill over into the pan while cooking. 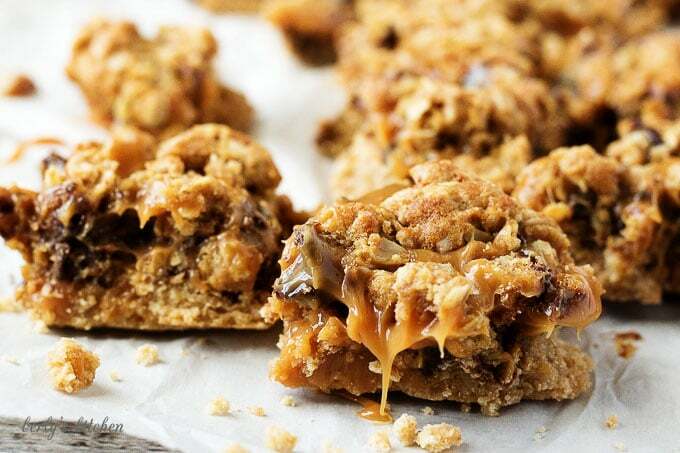 Using parchment paper helps with clean up and keeps the gooey caramel from sticking to the sides. Using a hand or stand mixer with a paddle attachment, mix the softened butter, brown sugar, salt and flour into a soft dough resembling loose cornmeal. The dough should hold together when pressed. Place the dough into the prepared pan and press evenly to cover the bottom. Cook the mixture on 325 degrees for 20 to 30 minutes or until golden brown. Cooking times may vary depending on pan type and oven. Remove from oven and allow to cool. The caramel sauce is easy to make and only takes a few minutes. 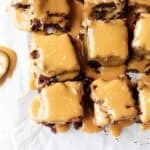 I like to use Kraft Caramel Bits or Kraft Caramel Squares depending on what’s available at the grocery store. The squares will take a bit longer simply because they have to be unwrapped. Either way, place the contents of the entire bag of caramels into a saucepan with the heavy cream. Cook over medium heat while stirring every couple of minutes until the mixture will begin to melt. At that point, constantly stir to keep it from burning. After the caramel has melted and is combined with the heavy cream, it’s ready to be added to the crust. Before adding the caramel, sprinkle 1 cup of semi-sweet chocolate chips over the cooled crust. Next, carefully pour the caramel sauce over the chocolate chips. Using a mixer or a large spoon and mix the melted butter, brown sugar, vanilla, flour, oats, baking soda, and salt. The mixture will be thick and should hold together when pressed. Using your fingers or a spoon, place the mixture on top of the caramel in a layer. It’s okay if some of the caramel seeps through. Preheat oven to 350 degrees. Place pan in the oven and cook for 15 minutes. Caramel may begin to bubble slightly and oat topping will start to brown. Be careful not to overcook because the caramel will burn. Remove the Carmelitas from the oven and allow them to cool for about 30 minutes before transferring them to the refrigerator. 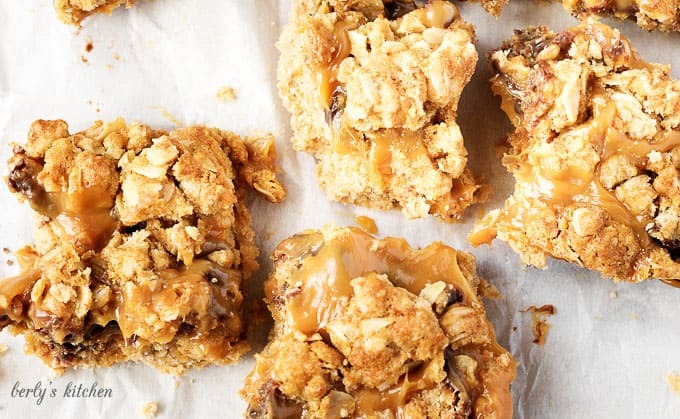 Place the pan of Chocolate Oat Carmelita Bars in the fridge and allow to chill until set. This is where I messed up in the video, and I knew better. It was later, and I was trying to get the video finished. I didn’t leave the bars in the fridge quite long enough, so the chocolate and caramel was a hot mess. Quite literally! The good thing about the caramel sauce in this recipe is that it will still be gooey even after refrigeration. Cut the dessert into squares and serve. After the Chocolate Oat Carmelita Bars cool in the refrigerator, remove and place on the counter for storing. If you like this carmelitas recipe, please leave us a comment and rate the recipe card. You can also find us on Facebook, Pinterest, Twitter and Instagram searching for Berly’s Kitchen! Prepare 8 x 8-inch and line with parchment paper. Using a stand or hand mixer, combine all ingredients for the shortbread crust on low speed until soft, crumbly dough forms. Place the dough into prepared pan and press evenly. Place pan in the oven and cook for 20 to 30 minutes or until golden brown. Preheat oven to 350 degrees (for a later step). Sprinkle the cup of chocolate chips over the cooled crust. 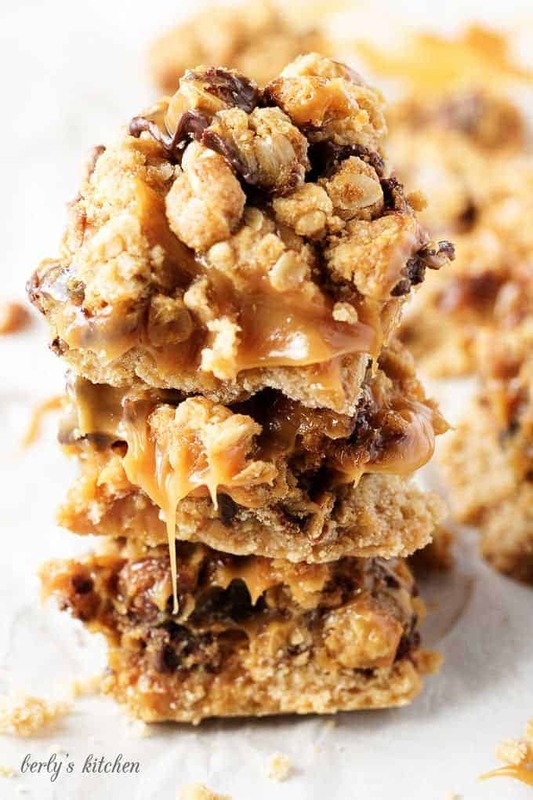 In a saucepan, combine caramel squares (or bits) and heavy cream. Cook over medium heat and stir every couple of minutes until the mixture begins to melt. Once the mixture starts to melt, stir continuously. After caramel mixture melts, pour over the chocolate chips. Using a mixer or a large spoon, combine all ingredients for the oatmeal crust. A soft mixture will form and should hold its shape when pressed. Using your fingers or a spoon, place the mixture on top of the caramel. Place pan in the preheated oven and cook for 15 minutes. Caramel will begin to bubble and oatmeal topping will start to brown. Remove from heat and allow to cool for at least 30 minutes then transfer to the refrigerator. Allow the dessert to chill in the fridge until set. Cut into squares and serve. Store in an airtight container for up to 3 days. *Nutritional information and calories listed are an approximate and based on ingredients and servings used the recipe. Made these for thanksgiving. They were a hit. Sooooo delicious! Thank you for the recipe. This is definitely going to be a new family fave! This looks so yummy…. I am definitely going to try it out… ….